Crux Products asked Wilde to conduct an assessment of their Tongue Seal to determine the behaviour of the seal during installation, the performance of the seal under the influence of the grout and to estimate the maximum load carrying capacity of the seal. Crux Products Ltd are involved in the design and development of sealing devices used in offshore substructure applications. The ‘Tongue Seal’ supports grout between a pile and a pile sleeve on structures where the ground piles are installed by drilling. The seal is fitted on the pile prior to installation and ‘self activates’ as grout is injected. 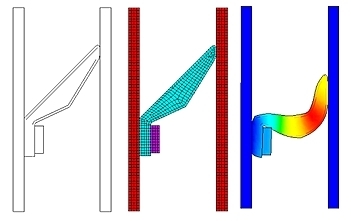 A non-linear finite element analysis was conducted within ANSYS. A cross sectional representation in the region of the Tongue Seal was developed and analysed using 2-D axisymmetric elements. A hyperelastic material model was used to capture the behaviour of the rubber Tongue Seal. Fabric reinforcement was included in designs where additional sealing capacity was required. Frictional contact conditions were used to capture the seal’s interaction with the surrounding pile and pile sleeve and to monitor its sealing characteristics. A multi-stage analysis estimated how the seal would deflect during installation and operation and also assessed the performance gains of increasing the thickness of the fabric reinforcement.